Installation of the new AstroTurf field at Penn State's Holuba Hall recently wrapped up. The field is the first in the Big Ten to feature Nike Grind infill. One of the nation’s most recognizable football programs is teaming up with one of the world’s most iconic sports brands, again. 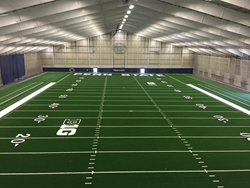 Penn State’s enormous indoor training facility, Holuba Hall, now sports a brand new premium AstroTurf® playing surface. Following this latest installation, five of the school’s six artificial turf fields currently boast AstroTurf synthetic turf systems. Holuba Hall’s new surface features a high face weight, high-density AstroTurf synthetic turf system with a unique component,Nike Grind infill. Nike Grind is a palette of premium recycled materials used in a variety of settings, including synthetic turf infill, providing sustainability and surface performance. Holuba Hall’s field will be the first of its kind in the Big Ten Conference with Nike Grind infill. Nike Grind infill is prepared for use in AstroTurf fields through a series of steps. First, excess rubber from the manufacturing of shoes is collected. This rubber conforms to Nike’s stringent quality standards and Restricted Substances List. The rubber is chopped up and properly sized for field drainage and uniformity. Finally the infill is encapsulated with a premium green-colored coating that boosts resiliency and gives AstroTurf fields the consistent and plush appearance athletes want. The amount of Nike Grind infill used is equivalent to the amount of material from recycling more than 100,000 pairs of shoes. TPK, a Certified AstroTurf Installer out of Allison Park, Pa., was responsible for this turf replacement project that began in June. The plan involved reconfiguring the facility from two 80-yard, side-by-side practice fields to one full-size football field. The team at TPK laid over 95,000 square feet of new turf inside Holuba Hall, which was reopened for use last week.